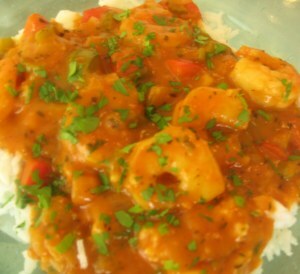 Etouffee (Eh too fay) is a marvelous Creole dish made with seafood such as shrimp or crawfish, although chicken, or chicken and seafood together are also employed. When preparing etouffee, which translates as “smothered”, first you make a roux, either a brown roux, made with vegetable oil and flour, or a blonde (not browned as much) roux, using butter. Although untraditional, in the past several years many cooks use tomatoes in these lovely, creamy etouffees. Make the shrimp stock, blend the Creole seasoning (or use a commercial product), and then make the etouffee. It’s good groceries, don’t worry. The shells and tails from 2 lb. of Shrimp. The heads are great too for wonderful flavour. Add all ingredients to a 2 qt. saucepan. Cover this with cold water. You’ll need about 1 1/2 Cups for the Etouffee. Bring to the boil, and then reduce the heat to a low simmer. Simmer for about 45 minutes. Strain the stock. · Season the shrimp with 1 Tbsp of the Creole Seasoning. · Melt the butter in a large skillet (cast iron is great) or dutch oven, add the onions, bell pepper, and celery, fry until translucent. · Whisk in the flour to make a roux, stirring constantly, about 5 minutes. The roux should turn a beige colour. · Stir in the remaining Creole Seasoning. · Add a small amount of the shrimp stock, stir well to form a paste, add the remaining stock gradually, whisking constantly. · Bring to boiling, and then reduce to a simmer. · Check to make sure you have enough stock; the end result shouldn’t be too thick, nor too thin. · Add the tomatoes, garlic, thyme, Worcestershire sauce, and hot sauce, a little salt, black pepper, and cayenne. Simmer for 20 minutes. · Add the shrimp, green onions, and parsley, simmer for 7 minutes more or until the shrimp are cooked through. Be careful not to overcook. Stir in the 3 Tbsp butter, and adjust the seasonings to taste. Serve over steamed rice. Enjoy this esteemed dish. I'd sure love to 'smother' that Etouffee! Oh LOVE etoufeee and your's looks delish! here via A to Z challenge and enjoying my look around. Thanks everyone for your comments, I appreciate them. another yummy post. i love how the word etoufee is spelled. sounds so fancy! NIKI: The colours are lovely, thanks for the compliment. NUTSCHELL: Thank You for calling. JOANNE: Enjoy it Joanne and spouse.